This upholstered chair features a classic silhouette and beautifully skirted base for a timeless piece that adds elegance to any room in your home. Rolled arms anchor each side of the chair with a traditional shape, while extra padding and superior coil construction provide a truly comfortable seat. 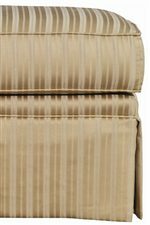 Pair with the coordinating ottoman for a beautiful set that brings traditional style and enhanced seating capabilities to your bedroom or formal living room. More than 1,000 designer fabrics allow you to customize this upholstered chair to reflect your style. The Baltimore Upholstered Chair with Rolled Arms by Kincaid Furniture at AHFA in the area. Product availability may vary. Contact us for the most current availability on this product. Fabric Options Over 1,000 designer fabrics. Frame Construction Select laminate hardwoods prevent warping and provide years of service. Secure mortise and tenon construction with corner blocks fastened and glued for added strength. Seat Support Premium quality 8-way hand-tied coil system using tempered steel coil springs tied at eight points for comfort and proper seat support. Padding & Ergonomics Deeply cushioned back lends extra comfort. The channeled design provides shape retention. Ticking that encases a special foam cushion wrapped with Dacron for comfort and resiliency. Densified batting covers all springs under sateen. 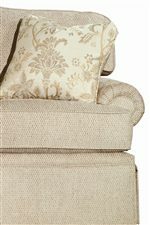 The Baltimore custom upholstery collection introduces understated traditional style into your home. A classic sofa, sleeper, chair and ottoman comprise this living room set, which features shaped seat backs and rolled arms for a truly timeless silhouette that will last for years to come. Superior coil construction and extra padding ensure a truly comfortable seat for you and your guests, while your choice of more than 1,000 designer fabrics lets you complete your living room with fashionable seating that truly suits you. Accent pillows add just the right amount of designer appeal, and skirted bases trim each piece for a neat, tailored look that has become the hallmark of traditional design. Outfit your home in sophisticated elegance with the Baltimore collection. The Baltimore collection is a great option if you are looking for Traditional furniture in the area. Browse other items in the Baltimore collection from AHFA in the area.